Every blogger has, or should have Akismet running on their system. And every blogger has likely been amazed and thankful for all the spam comments that it has filtered out from their account. But you just have to be amazed. As a blogger you continually get spam comments sent to you, and you have to have a way to block them. Akismet does that very well, as indicated by the tallies in our account today. This entry was posted in GoLiNiel Site on August 25, 2007 by golinielcomblog. 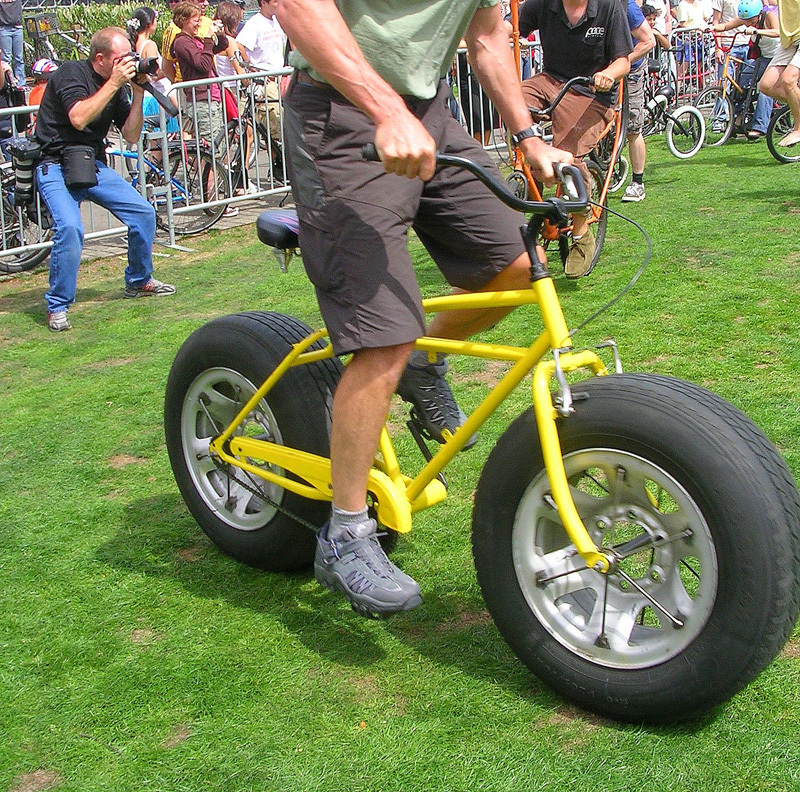 Honey and I tooled down to the Portland waterfront to check out the Tour de Fat bike fair. We rode past the park during our Saturday ride, in which we tested out our Bike Fridays. Basically it is a celebration and gathering of bicyclists, combined with a promotion by a local beer microbrewery. Lots of different types bicyclers, and a varied collection bike types, and ages. Sort of a bicycle cruise-in. They had some great music by a blue grass/swamp rock band, but we did not catch their name. It was a good stop in the middle of our ride, and a fun way to spend part of the afternoon. The Bike Fridays performed great, and they are cleaned and tuned and ready to go. This week they will get folded up and put into their cases, and soon will look like any other suitcase on the airport turnstile. This entry was posted in Bicycling & Fitness on August 24, 2007 by golinielcomblog. Reelight – A self charging bike light. Some very cool lights available at Reelight and developed in Denmark, a country that knows what bicycling is all about. This entry was posted in Bicycling & Fitness on August 23, 2007 by golinielcomblog. People at the top of every profession share one quality â€” they get things done. This ability supercedes intelligence, talent, and connections in determining the size of your salary and the speed of your advancement. This entry was posted in Social on August 23, 2007 by golinielcomblog. We got out on the bikes early on Saturday before the dark clouds rolled in. The ride on the Springwater trail provides nice views of the Willamette River and some of the great bridges that cross over it. Stopping to photograph bridges is easier on a bike. Here, an osprey makes use of the dead tree which provides him with an advantageous view for himself. Although his purpose, and ours, differ a great deal. This entry was posted in Bicycling & Fitness, Spanning the Bridges on August 21, 2007 by golinielcomblog. C’mon down to the Tour de Fat this Saturday at Waterfront Park! Noon – 6 pm, at Waterfront Park and SW Salmon St., FREE! Tour de Fat is a traveling festival put on by the recreational geniuses at New Belgium Brewing, to benefit local bike advocacy groups! This Saturday, all proceeds from beer sales will go to the BTA, and all proceeds from gear sales will go to Portland United Mountain Pedalers. 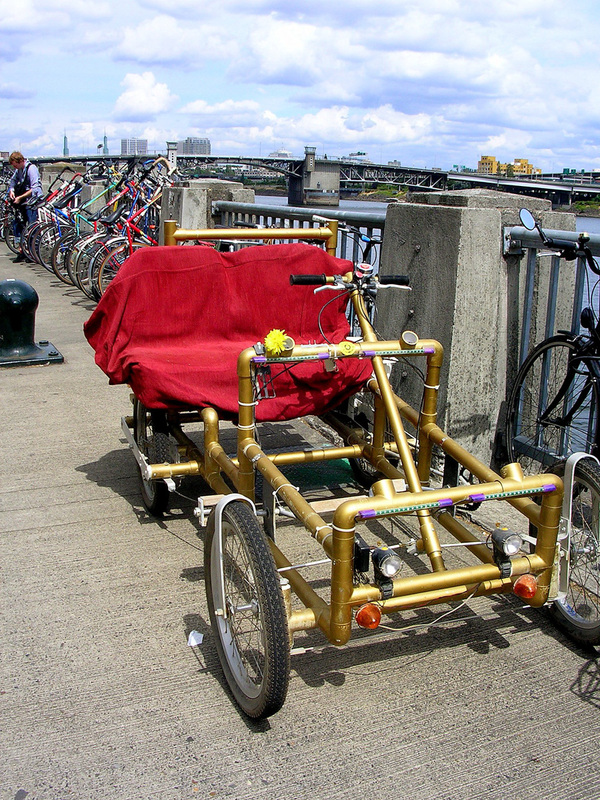 This year’s theme is “Salvation from Dumpnation,” and one lucky Portlander will trade in her car – she’ll sign over the title right there – for a sweet commuter bike (and yes, we already know who she is). 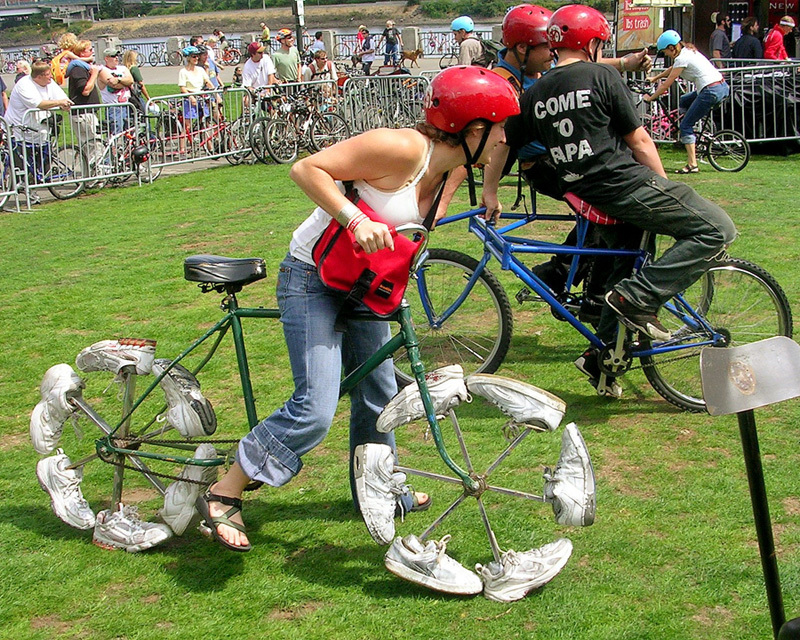 Check out some crazily re-engineered bikes you can try and ride, a pre-event parade at 11 am, a kids’ helmet decorating table, and great live music from March Fourth Marching Band, the Yard Dogs Road Show, the Sprockettes, and others. Hope to see you there! And big thanks to the BTA volunteers making it all go ’round. This entry was posted in Bicycling & Fitness on August 16, 2007 by golinielcomblog. Michael Rasmussen ReTour Race game may be a little misdirected. But this here is funny. This entry was posted in Comics on August 16, 2007 by golinielcomblog. Another bridge collapse. In China over the river Tuo. The Monday collapse in the southern town of Fenghuang rekindled concerns about rushed, shoddy building amid China’s torrid economic expansion. Fenghuang is famed for its riverside stilt houses and local families commonly wash laundry and dishes in the Tuo. Witnesses described hearing a rumble and seeing stones fall from the structure Monday afternoon after construction workers removed the supportive frame from the 42-meter-high, 268-meter-long vehicle and pedestrian bridge across the Tuo River. ”The whole thing collapsed,” said Nong Xiaozhong, one of two survivors in a 12-man construction team working under the bridge. The collapse was likely to fuel already deep public concerns about the quality of construction in a country undergoing breakneck economic development and where corruption among contractors and officials is common. Nong, the construction worker, said he and his fellow workers worried the bridge’s stone arches were too large and that the mortar was not dry enough to remove the scaffolding. 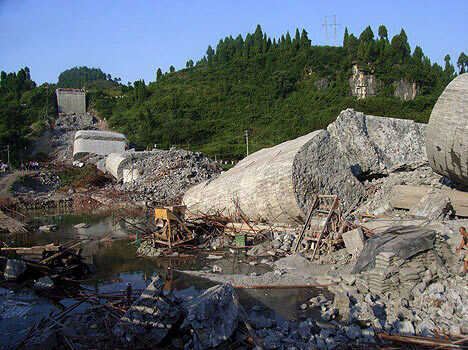 The state-run China Daily, in a report Tuesday, said that the Ministry of Communications last year deemed 6,300 bridges as dangerous because of serious damage to their “structural components.” It quoted a prominent engineer as warning that many new bridges were poorly designed and built and that China needed to heed the Aug. 1 collapse of a bridge in Minnesota that killed at least nine people. This entry was posted in Spanning the Bridges on August 15, 2007 by golinielcomblog. Looking for a quiet bike-riding trail in Clark County? Want a safer route to ride to work in Portland? Pedal over to Clark County’s Public Service Center, 1300 Franklin St., for your free copy of the updated Cycling the Cities map. One side of the map, which folds to 4-inches-by-9-inches, shows routes along streets and roads in Clark County as far north as 159th Street and as far east as 242nd Avenue. Inserts also show routes to and across the Interstate 5 Bridge. The map’s flip side shows routes and roads in Portland as far west as 91st Avenue and as far east as 148th Avenue, including the Glenn Jackson Bridge. It also shows rules of the road for bicycle riders and lists resources for bike riders on both sides of the Columbia River. A paper version on the map is available at no cost in the county’s GIS Map Store in Suite 232 of the Public Service Center. A water- and tear-resistant version is on sale for $4. This entry was posted in Bicycling & Fitness on August 14, 2007 by golinielcomblog. Junction City Scandinavian Festival is on! 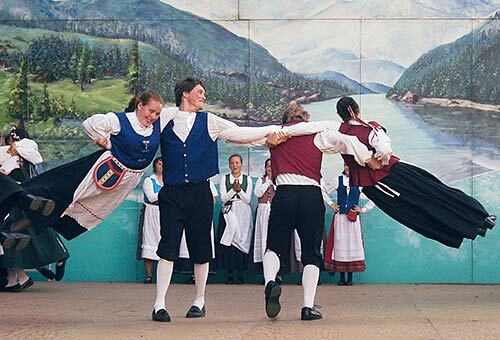 The Scandinavian Festival starts today, Thursday Aug 9th, and continues through Sunday the 12th. The festival is in downtown Junction City, just north of Eugene, on Highway 99. It is easy to find. This year, opening day is Danish Day! You can watch Danish Aebleskivers being made. The previous two photos are courtesy of Digital Dreams Photography. We will be there sometime this weekend and hope to take some original photos. You can always get a full Scandinavian meal any time of the day so it doesn’t really matter when you get there. 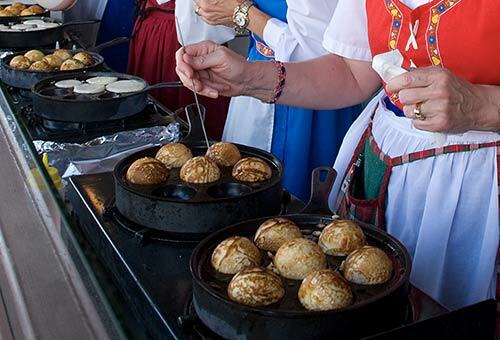 While you are there, the one thing you do not want to miss is the Lutheran Aebleskiver booth. It is pretty interesting to watch them being made and the fresh and hot aebleskivers are well worth the wait. Lots of handmade crafts, dancing, music and entertainment to be found night and day. The wine terrace under the water tower is a nice place to take some food and share some drinks. This entry was posted in Portland, Or, Oregon on August 9, 2007 by golinielcomblog. 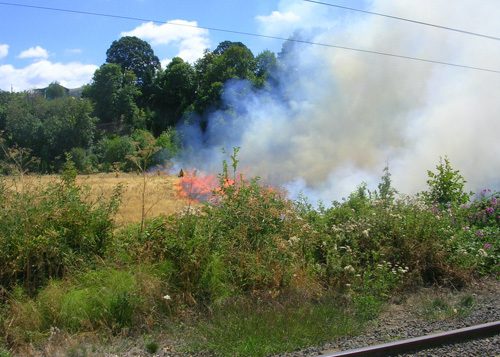 Early this week on our way to Oaks Park, we spot a sign in the middle of Springwater Corridor, announcing a burn and warning of potential smoke issues on Saturday August 5th. Ok, we can take a hint and I make a mental note. Something like, maybe we should avoid it. Yet like so many mental notes, I discard them, and on this Saturday morning as we are biking the corridor on our way to the Portland Farmers Market, I am reminded, since the signs are still there. It was all clear heading north, but coming home in early afternoon we could see the smoke rising above the trail from at least a mile away. The City employees and the Fire Dept were out in force and seemed to be doing a great jog. There was a flagger advising bikers and walkers down to the Park entrance road, we took this advice but I couldn’t help scooting back up the next access trail to catch a closer glimpse and snap a shot. There was even a very friendly city parks guy wandering around dispensing information about what they were doing to just about anyone who would listen. The short course on why? It cuts down on unintended wildfires that can spread uncontrollably. Regular burns seem to be bad for the invasive plants, and good for the naturalized plants, giving them a chance to flourish with less competition. Apparently it is also good for the little critters of the area, but I didn’t get a clear explanation as to how that can be. There is other stuff on this as well of course. 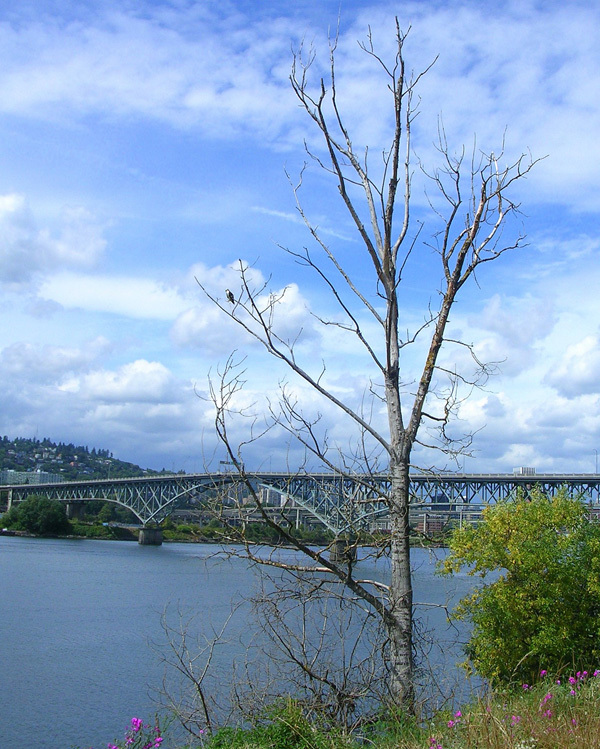 Portland Parks has a Wildfire Risk Reduction Plan. This entry was posted in Portland, Or, Oregon on August 6, 2007 by golinielcomblog.